*The following product was provided to me by KBShimmer in exchange for my honest review. KBShimmer 5th anniversary celebration month is continuing! Through Wednesday, August 21st, KBShimmer is offering free shipping $15+ orders! In honor of this offer, I have a gorgeous to polish from KBShimmer you might want to add to your shopping cart ☺. 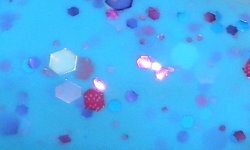 Watercolor is a bright blue crelly base filled with blue, purple, pink hex glitters, and silver holographic glitters. Color: Beautiful, stunning, and a "Why did I not have this in my life sooner? ", type of color. Those glitters bouncing off that insanely gorgeous bright blue base is magic. This is just one of those polishes that deserves a second, third, and forth glance. The color is eye catching and beautiful. Formula: This is on the sheerer side, but builds up to opacity in 3 coats. Price: This is $8.75 on KBShimmer's website. Remember you get free shipping on orders $15+ through 8/21. If you're wondering about a second polish to pick up to get the free shipping, I recommend Spring Training, Sugar Plum Faerie, or Iris My Case (or all of them), those are some of my personal faves! Overall: You need this. I'm declaring this a must have! This polish is magical! * I received the above product by KBShimmer in exchange for my honest review. I'm curious . . . does this top coat have good coverage of the components (glitter, etc.) in just one coat? I don't necessarily like to put my top coats over another color of nail poiish, just on my bare nails :-) Thanks in advance for your response. Or, does it have a "base coat" of it's own color built-in? This polish isn't a top coat. I used 3 coats of this on its own in the above photo. This will not have good coverage in one coat though, it is sheer. You will have to layer on at least 3 coats to have complete coverage. I also have this one and love it! Great swatch. I love this polish! It's one of my favorites from KBShimmer. I were super happy when I managed to get my hands on this pretty, it is simply gorgeous! Love it! KBShimmer is very quickly becoming one of my absolute favorite indies! I'm just sorry I didn't have it sooner! I think I can declare KBShimmer as my favorite indie! Haha, you should! You won't be disappointed.